Ubiquilin-2 (UBQLN2) partners with the protein HSP70 to shuttle aggregated proteins to the proteasome for degradation, according to a new study published August 11 in Cell. The results identify a new mechanism, independent of autophagy, by which the cell can eliminate protein aggregates, and further implicate a defect in misfolded protein clearance in ALS pathogenesis. They also suggest that mutations in UBQLN2 cause ALS by a loss of function, though other mechanisms may also be at play, experts say. 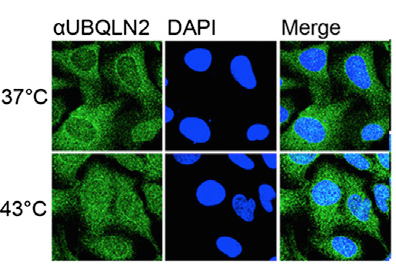 UBQLN2 translocates to the nucleus under conditions of heat stress. [Image credit: Hjerpe, Bett et al., Cell 2016 under CC BY 4.0]. Proteins tagged with ubiquitin chains are targeted to the proteasome for degradation in one of two ways, Kurz explained: either through direct interaction with proteasome-bound receptors, or via “shuttles” that link a variety of poly-ubiquitylated proteins to the proteasome (Glickman and Ciechanover, 2002; Verma et al., 2004). A yeast shuttle protein, called Dsk2, is homologous to four vertebrate proteins, including UBQLN2, a protein associated with ALS and frontemporal dementia (see Aug 2011 news). UBQLN2 has a central domain with homology to a heat shock binding protein called STI1, which interacts with a protein similar to the known chaperone protein, heat shock protein 70 (HSP70) (Kaye et al., 2000; March 2016 news). The possible interaction between the UBQLN2 and the protein folding machinery led Kurz, co-first authors Roland Hjerpe and John Bett, and colleagues to explore the function of UBQLN2 and its potential role in regulating protein misfolding and degradation. Working in cell culture, they found that the properties of UBQLN2 changed after heat shock: it became activated and it interacted increasingly with HSP70, as well as with the proteasome and poly-ubiquitylated proteins slated for clearance. Depletion of UBQLN2 using small interfering RNAs (siRNAs) caused cells to be hypersensitive to heat shock, and also impaired clearance of ubiquitinated protein aggregates. This response occurred under stress conditions other than heat shock stress, since degradation of unfolded proteins that accumulated in response to puromycin treatment was also impaired by UBQLN2 depletion. An intriguing aspect of UBQLN2 function is its role in promoting clearance of protein aggregates in the nucleus, where autophagy pathways are not active. In cells expressing GFPu-NLS, a model unfolded nuclear protein, UBQLN2 was necessary to promote clearance of nuclear GFPu-NLS aggregates that formed following heat shock. What promotes binding of UBQLN2 to HSP70? The authors explored this in an in vitro model, and found that binding of these two proteins was induced in the presence of HSP70 substrates, such as a denatured protein. These denatured proteins also strongly induced recruitment of the ubiquilin-HSP70 complex to the proteasome, suggesting that the proteins slated for degradation trigger assembly of the degradation complex. The team next explored how UBQLN2 mutations affect its function in vivo by developing constitutive knock-in mice that express mutant UBQLN2. Using mouse embryonic fibroblasts from the male knock-in mice, they found that mutant UBQLN2 binding to HSP70, ubiquitylated substrates, and the proteasome was reduced. Although mutant UBQLN2 still translocated to the nucleus, it did not effectively recruit protein aggregates; affected cells had increased susceptibility to both heat shock and puromycin treatment. “Together, these data suggest that the disease-linked forms of UBQLN2 are loss-of-function mutations,” they concluded. Mice carrying UBQLN2 mutations were cognitively impaired, but did not exhibit a strong motor phenotype. 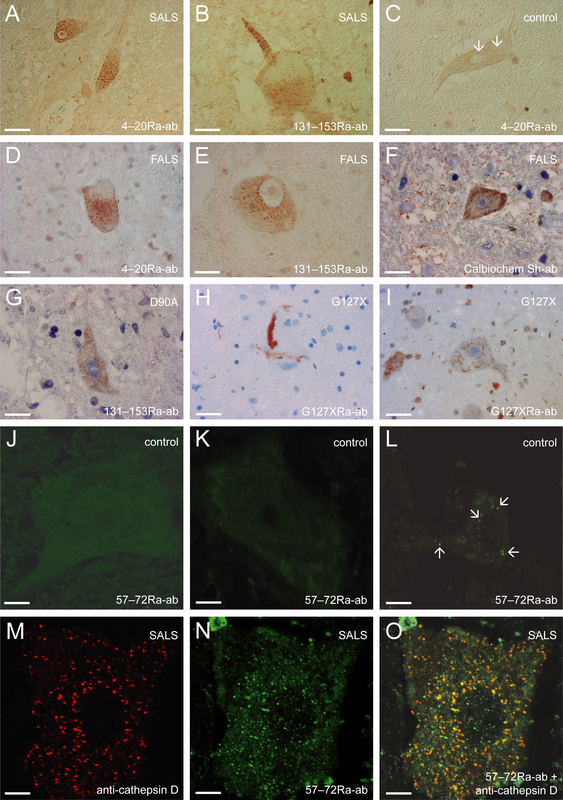 UBQLN2 and p62 were found in inclusions in hippocampus, brain stem, and cortex. The investigators next turned to examined UBLQLN2 in a Huntington’s disease (HD) mouse model, based on findings that UBQLN2 binds huntingtin (HTT) aggregates in pathological samples from HD patients (Rutherford et al., 2013). Wild-type UBQLN2 bound to expanded HTT protein in the R6/2 transgenic mouse model of HD. When these mice were crossed with UBQLN2 knock-in mutant mice, double mutants had higher levels of aggregated HTT and lower levels of soluble HTT, suggesting that UBQLN2 promotes aggregate clearance in vivo. Ian Blair of Macquarie University, Australia, who was not involved in the study, noted that for UBQLN2 mutations, “this study has teased out where the potential defect in the delivery system is” for misfolded proteins targeted to the proteasome. “This may give us better opportunities to target that defect therapeutically.” While UBQLN2 mutations are a rare cause of ALS, the implication of the protein quality control system means that proteostasis is “likely to play a role in a much wider range of ALS,” he said. One of the interesting facets of the UBQLN2 story, he noted, is that it is not a shuttle for all proteins—its substrates are limited in ways that are not yet clear. “The next step would be to find out what those substrates are, as that may explain why mutations specifically affect the spinal or cortical neurons in ALS and FTD”. In addition, the identity of those substrates may point to new therapeutic targets. “This paper provides some very important insights as to how UBQLN2 may be acting in certain circumstances,” said Teepu Siddique of Northwestern University in Chicago, IL, who was not involved in the study. “If this was a simple loss of function of UBQLN2, there would be pathology or impairment,” Siddique said. “This is a very interesting and detailed paper that shows some of the properties of UBQLN2”, however, he noted, the conclusion that UBQLN2 mutations simply cause a loss of function may not be the whole story, based on work showing that the knock-out rat has no phenotype (Wu et al., 2015). 1. Hjerpe R, Bett JS, Keuss MJ, Solovyova A, McWilliams TG, Johnson C, Sahu I, Varghese J, Wood N, Wightman M, Osborne G, Bates GP, Glickman MH, Trost M, Knebel A, Marchesi F, Kurz T. UBQLN2 Mediates Autophagy-Independent Protein Aggregate Clearance by the Proteasome. Cell. 2016 Aug 11;166(4):935-49. Epub 2016 Jul 28. [Pubmed]. 2. Brown R, Kaganovich D. Look Out Autophagy, Ubiquilin UPS Its Game. Cell. 2016 Aug 11;166(4):797-9. [Pubmed].